Disruption Magazine Launches Today | CompuVision Systems Inc.
Get Caught Sleeping at Work, Your Boss Will Thank you! 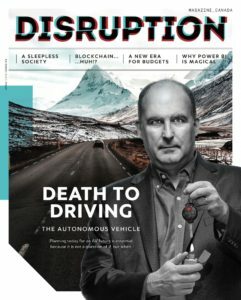 Edmonton Alberta 04.06.2018 – The launch of the first issue of Disruption Magazine Canada takes place today, with an online version including audio download and printed distribution across Canada. Disruption Magazine Canada will be coming out quarterly and is geared toward business owners, thought leaders and innovation enthusiasts. It has content surrounding disruptive technologies, such as autonomous vehicles, power bi (business intelligence), blockchain and more. In this first addition you can find prominent names like Jim Harris who is one of North America’s foremost authors, speakers and consultants on Disruptive Innovations, and a #1 International Bestselling Author for BlindSided! Jim Harris writes for a number of publications, including the Globe and Mail, Profit magazine and Backbone magazine. Karina Birch, co-owner and CEO of Rocky Mountain Soap Company and David Bridges, Edmonton’s First Certified Blockchain Specialist. More information about the magazine can be found on their website.